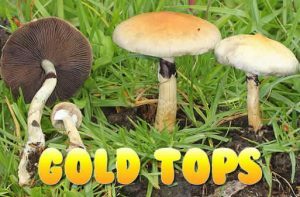 In Australia you find Gold tops (Psilocybe cubensis) only in New South Wales and Victoria. Their season runs from Spring through Summer. They enjoy a temperate climate with a temperature in a consistent mid-20s. They flourish after the first heavy summer rains. These medium to high potency mushrooms have a large growing a cap of up to 20 cm. As the yellowy white to dark brown coloured cap matures its cap is grows flat or becomes uplifted. It becomes covered in thick purple coloured spores. Identifying Australian gold tops. Its surface is often moist to the touch and it has white flesh that leaves a blue stain. The veil can remain attached to the stem and covered in purple spores. The gold top’s stem is yellowy white and swells towards the bottom of the stem. Its stem can be hollow and turns a blue/green colour when damaged. The gold top is easy to recognise by the huge gold top and its veil. Found: The gold top is only found in New South Wales and Queensland from Spring through Summer. It grows in manure and areas composted with manure. You can usually find gold tops in cow paddocks. Hello wonderful people. I live near the Yarra Valley in Victoria… can anyone help me with picking locations nearby? Perhaps Warbuton? Also @Gold Coast. Any tips for locations? Or hunting groups? Anyone know where to find some near Gold Coast? They are in SA as well. I read your post about srooms and was hoping you could tell me where in NSW (sydney) I can find them.